This French café standard is a sophisticated take on the ham and cheese. The name comes from the French words for “Mr.” and “crispy.” Well, we’ve spiffed him up a little. 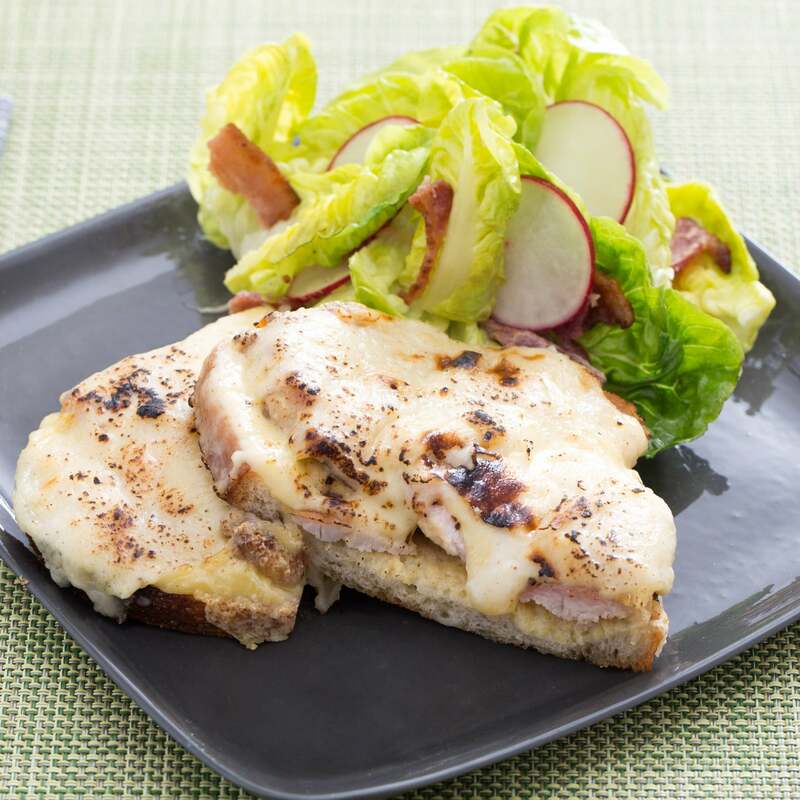 You’ll serve these sandwiches open-faced, topped with seared, sliced pork, melted Swiss cheese, tangy Dijon mustard and a creamy béchamel sauce. 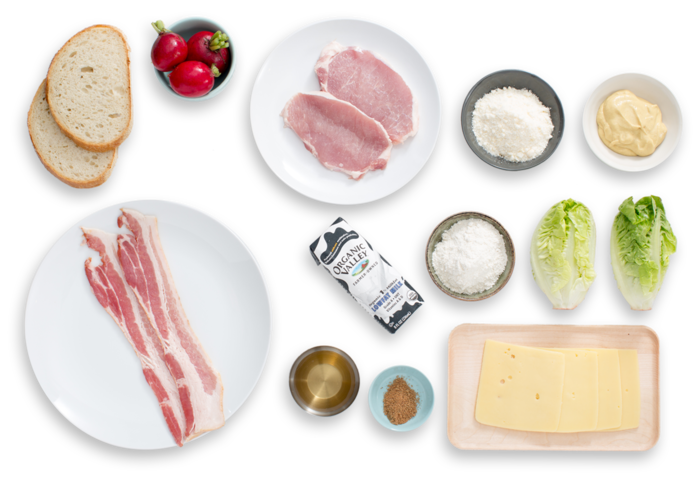 And for the salad, you’ll be using fresh fall produce and bacon to create a hearty, smoky side dish. It’s a fun, fine-dining spin on this classic. Hats off to you, mister. Preheat the oven to 500°F. Wash and dry the fresh produce. Cut off and discard the root ends of the baby gem lettuce heads; separate the leaves. 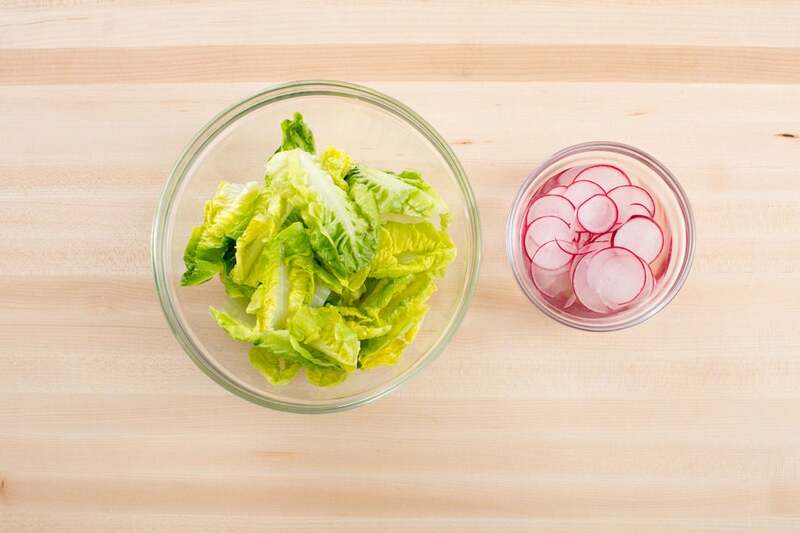 Thinly slice the radish into rounds. Place the rounds in a bowl of cold water. Heat a large, dry pan (nonstick, if you have one) on medium-high until hot. Add the bacon and cook, flipping occasionally, 4 to 5 minutes, or until crispy and evenly browned. 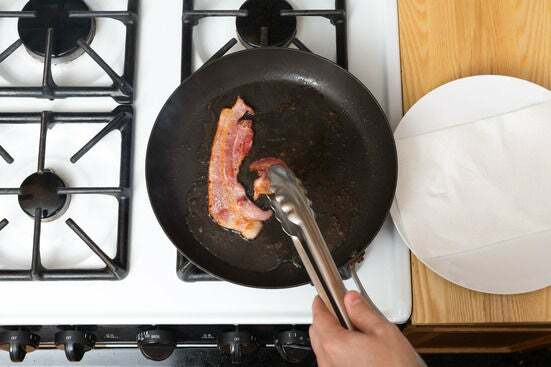 Transfer to a paper towel-lined plate, leaving any bacon fat in the pan. Season the pork cutlets with salt and pepper on both sides. Place half the flour on a plate; coat both sides of the pork cutlets in the flour. Heat the pan of reserved bacon fat on medium-high until hot. 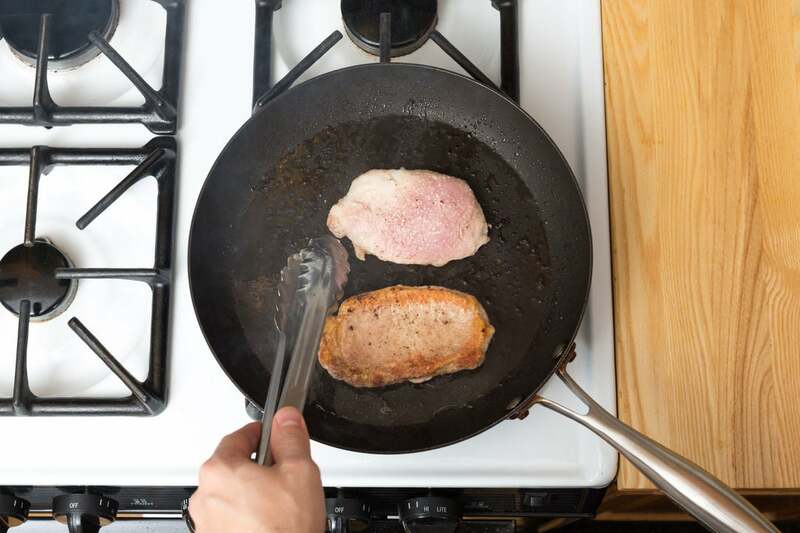 Add the seasoned pork cutlets and cook 3 to 4 minutes per side, or until golden brown and cooked through. 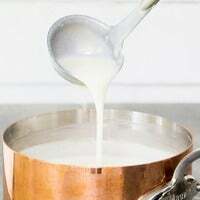 Transfer to a plate, leaving any drippings in the pan. Let the pork rest for at least 5 minutes. While the pork cutlets cook, in a large pot, heat 2 tablespoons of olive oil on medium until hot. Add the remaining flour and cook, whisking constantly, 1 to 2 minutes, or until golden brown. Add the milk and spice blend; season with salt and pepper. 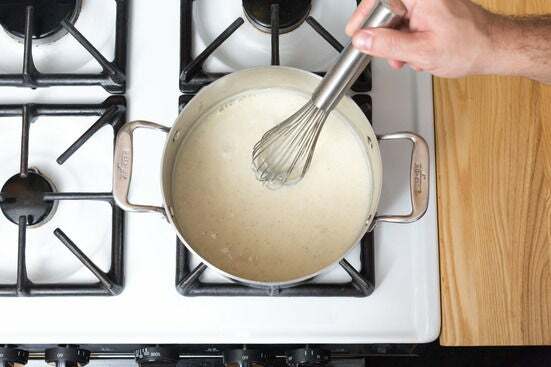 Cook, whisking constantly, 1 to 2 minutes, or until thickened. Add the Parmesan cheese; whisk until just incorporated. Remove from heat and set aside. In the same pan used to cook the pork cutlets, heat the reserved drippings on medium until hot. Add the bread slices. Toast on one side, 2 to 4 minutes, or until browned and crispy. Transfer to a sheet pan, toasted side down. Thinly slice the pork cutlets on an angle. Spread one-quarter of the Dijon mustard (save the rest for the salad) onto each toasted bread slice. Evenly divide the sliced pork and Swiss cheese between the bread slices. Top with a few big spoonfuls of the béchamel sauce. Bake 4 to 6 minutes, or until the cheese has melted. 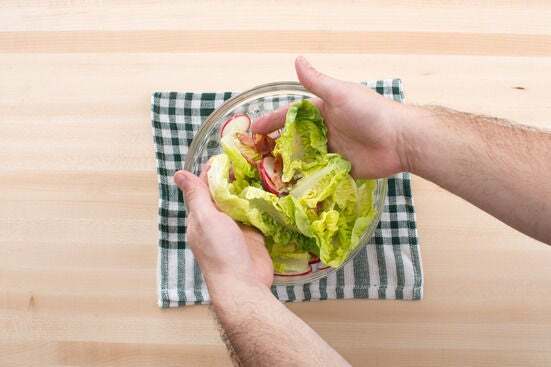 While the sandwiches bake, in a medium bowl, whisk together the vinegar and remaining Dijon mustard; season with salt and pepper. 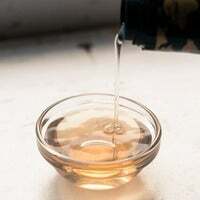 Slowly whisk in 2 tablespoons of olive oil. In a large bowl, combine the lettuce, radishes (draining before adding) and bacon (crumbling as you add it). Add enough of the Dijon dressing to coat the greens (you may have extra dressing); toss to mix. 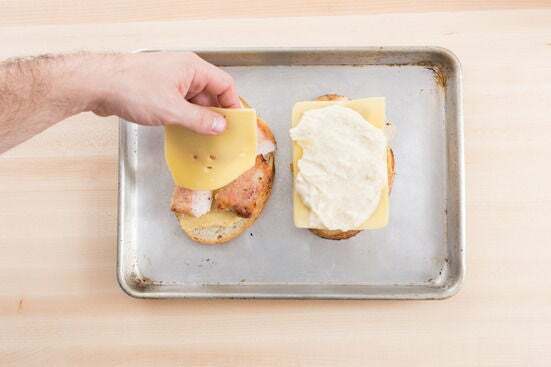 Cut the baked sandwiches in half and divide between 2 plates. Serve with the salad on the side. Enjoy!